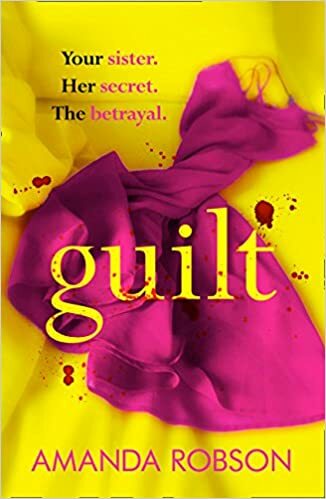 Guilt is an addictive psychological drama by Amanda Robson. Claustrophobic, tense and told in short, snappy chapters, towards the end I found this novel impossible to put down. This book showcases some really excellent writing and skill in creating tension. Zara and Miranda are twins. Amanda Robson opens her novel with a shocking opening scene which immediately had me intrigued. One twin has just killed the other, but who is in who’s place? We don’t find out until much later. Amanda then takes us back in time and unravels the twin’s relationship over the past several months. They are clearly two sisters who love each other dearly, but when Sebastian (Zara’s new boyfriend) enters the fold, their situation begins to change and tensions develop between them. It is clear that Sebastian is a dangerous and damaged individual, but what are his plans for Zara and Miranda? And what catastrophe results in one of them killing the other? We hear from the voices of Zara, Miranda and Sebastian, but predominately from Zara and Miranda. As the reader we know what is coming after reading the opening pages, and this revelation early on, had me searching for clues in the text, as I tried to work out what was going to drive them into this situation. They were both compelling character’s to explore and they had interesting backgrounds. One theme which Amanda chose to explore through her characters, was that of mental health which runs throughout the book. Although there were some disturbing scenes in which this particular theme was the subject, it was handled delicately and it brought the issue to the forefront of my mind, particularly with how people who suffer from mental health must feel. Guilt is a tension filled drama that will keep the reader guessing. Amanda Robson is a writer who I am keen to read more from. Thank you to Sabah Khan at Avon Books for sending me a copy of the book to review and for inviting me to take part in the blog tour.